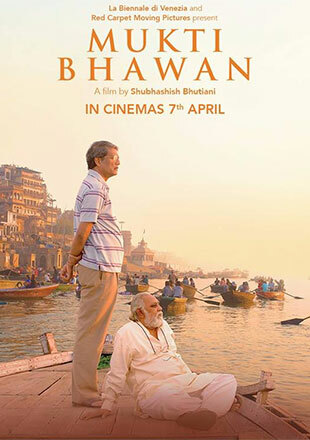 Shubhashish Bhutiani’s Mukti Bhawan (Hotel Salvation) is a beautifully made contemplative story of family, guilt, love, and finally death. Dayanand (Lalit Behl) is from that blissful generation of men who don’t need to think about whether they are interrupting or are they being too demanding. Everything revolves around him. When he decides his time has come, there is no way to rationalise or compromise with him. Dayanand sulks and insists he will go to Varanasi alone because he is ready and therefore it is his time and that is where he will die. 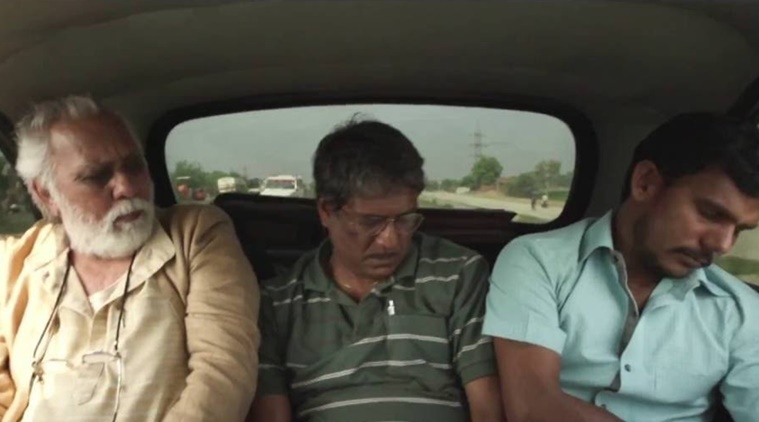 His son Rajiv (Adil Hussain) reluctantly commits to going with his father on what might be his last journey. They travel to Varanasi, and check in at the ramshackle Mukti Bhawan where people await their death by the holy Ganges. The efficient owner Mishraji (Anil K Rastogi) tells them he only allows a stay of 15 days and Dayanand is sure that will be enough. As it happens, Mishraji has a loophole whereby residents can change their names every 15 days. But he assures Rajiv the time is indeed close, although he can’t divulge any more details. Lalit Behl is by turns childlike, childish, arrogant, demanding, apologetic and affectionate. Dayanand is not used to showing weakness in front of his family, but seems less uptight with his peers at the Hotel Salvation. Daya immediately immerses himself in the daily rituals and starts making friends with the other residents. He is there to actively prepare for his death and welcomes the process. He joins in writing obituaries and practicing yoga, and is addicted to a TV soap they watch every night. He finds community in the house. He is occasionally over the top but only when Daya is in a heightened state, and I thought every note rang true for the grumpy patriarch. 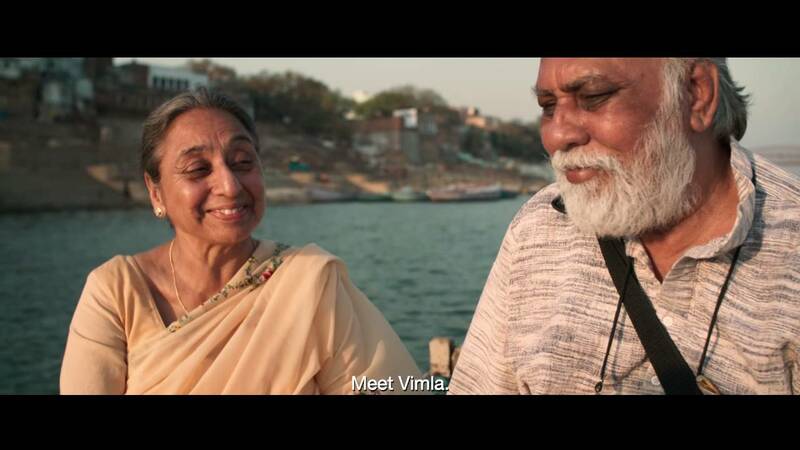 Vimlaji (Navnindra Behl) has genuinely prepared to go but can still enjoy every day she spends on earth. She says she will go when God calls, and has been waiting for 18 years. She is vivacious, the kind of lady you’d have tea and a natter with on a long train trip, but has a calm focus on her task of letting go. I liked her acceptance without finding her passively fatalistic. Vimla’s rapport with Daya is lovely, and I read somewhere the actors are married in real life which may be a factor in the warm familiarity and physical ease around each other. Rajiv is awkward and appalled by what he sees as squalor and backward thinking, and wants his dad to either come home or go to a hospital. Rajiv is almost like a child again, hanging around on the fringes of adult conversation and not quite being able to participate. He wants to be there to do the right thing, but he doesn’t want to be there at all. He is intimidated by his father, and calls from his wife and demanding boss don’t help matters. Adil Hussain is lugubrious, tetchy, and a little fragile as Rajiv. He is in a rut at work and at home, and his father’s death plans are highly inconvenient. He doesn’t see the value in what Daya is doing, thinking of it as taking him away from work. But he starts to open up and shows that his frustration is driven by love and a maybe a bit of an inferiority complex. His scenes with Lalit Behl are emotionally complex yet very contained. There are few grand gestures or raised voices, and the acting is perfectly aligned. Rajiv’s wife Lata (Geetanjali Kulkarni) struggles with a demanding old father-in-law and an absentee husband. Rajiv and Lata aren’t wishing for Dayanand to die but they do wish they could get some idea of how long this phase will last. 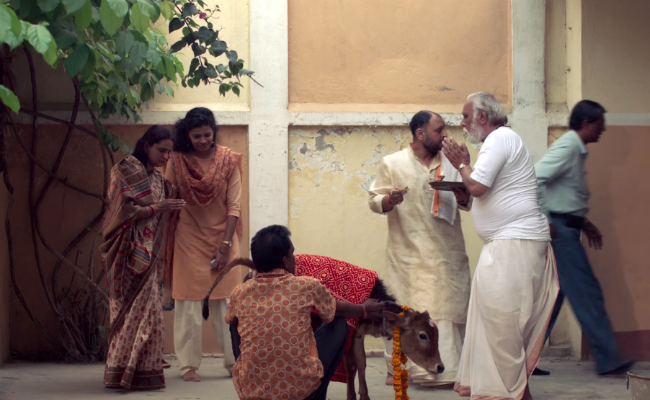 When Dayanand performs the cow donation ritual, it is life and death to him, but to the family it is just an interruption. Lata wants life to be normal, unexceptional, and organised. She seems brusque but when people need her affection it is there. Her scenes with Rajiv run from shockingly direct conversation to wordless empathy and she is the bedrock of the family. There is often a point in family crises where you’re damned if you do and damned if you don’t. Everyone has their idea on what is right and what everyone else should be doing. That tension is drawn out very well, mostly through the character of Sunita (Palomi Ghosh). She is a bright and warm girl, and has a cheeky rapport with her granddad. Daya is less strict and demanding of her and Rajiv quietly absorbs the difference in how his family interact with each other and with him. When Sunita comes to visit, Dayanand and Vimlaji sneak a bhang lassi with her because it’s Varanasi and of course they should. The three of them giggle through the day and each takes comfort in the camaraderie. When Daya hints that she might not be happy with her upcoming engagement Rajiv brushes it off. Later he confronts Dayanand about why he was made to do what was expected rather than follow his passion. Rajiv is more like his dad than he realises. Tajdar Junaid’s soundtrack complements ambient sound of prayers and TV and kids playing. Bhutiani and his crew largely eschewed the more sensationalised Varanasi cremation clichés and instead dwell on the daily rituals, the bustle of the narrow back streets, the changing light, and the overwhelming feeling that life is a cycle. 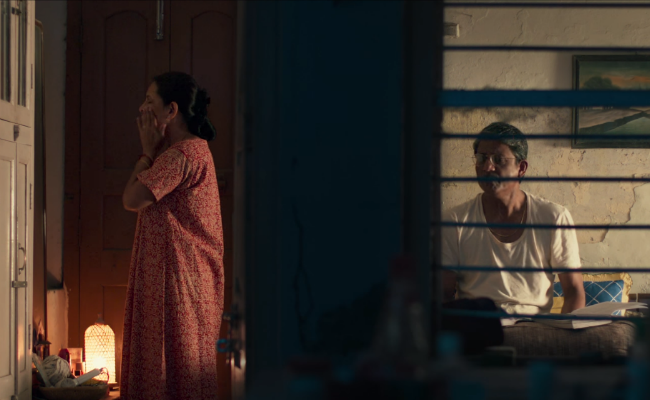 Mukti Bawan is somewhat similar in content (if not in tone) to Piku, with a dominant patriarch on a journey only he comprehends and a family who don’t quite realise they are being given precious time to say goodbye. This entry was posted in Hindi and tagged Adil Hussain, Anil K Rastogi, Geetanjali Kulkarni, Hindi, Lalit Behl, Navnindra Behl, Palomi Ghosh, Shubhashish Bhutiani, Tajdar Junaid. Bookmark the permalink.